War for the Planet of the Apes is the third and final installment in this prequel trilogy in the Planet of the Apes franchise. I must say, although it may not be as good as its predecessor, Dawn of the Planet of the Apes, it is a worthy successor and is a fantastic finish to this trilogy that nobody thought would work. To start things off, this may be the performance that really creates some buzz for Andy Serkis and a Best Actor Oscar nod for his portrayal as Caesar. Much akin to The Lord of the Rings trilogy and its Oscar success with its final installment, I could see the same happening with Serkis, as he has nearly perfected the art of the motion capture performance. I know that the VFX artists may alter some facial expressions here and there, but from clips that I’ve seen behind-the-scenes, I do believe that Serkis acted his heart out with this role all throughout the series. Another fantastic performance was from Woody Harrelson as Colonel McCullough. He really captures this essence of a power-corrupted, vengeful autocrat and he is a presence whenever he’s on the screen. The series has done a pretty good job in casting their human co-leads with James Franco, Jason Clarke, and Woody Harrelson all doing a magnificent job in carrying their own and acting alongside the likes of Serkis. The film does a great job in providing motivation behind Colonel McCullough’s outlook on ape/human relations, and the audience really does get this sense of not knowing who to side with. However, the actions taken by McCullough will ultimately make the human audience side with the apes funny enough. While both of these actors delivered fantastic performances probably worthy of some Oscar-noms, I think a lock for an Oscar nomination or even a win will be with the Visual Effects department. 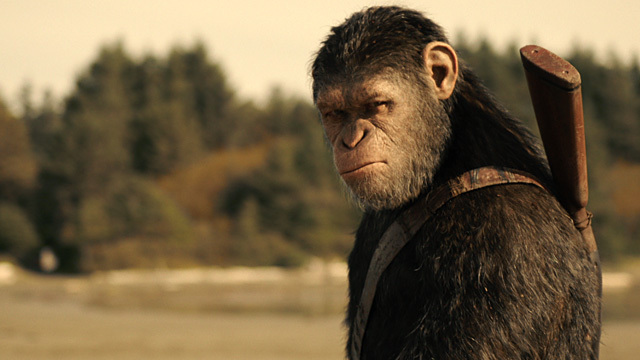 I thought that the apes in the previous film looked life-like, but this film really had me in awe with the visual effects done on these creatures. All of the apes look convincing, but the standouts are in Bad Ape and in Maurice, who still keeps my mouth agape with how life-like that character is. The textures on the apes are absolutely incredible, the facial expressions were pin-point, and this is an overall groundbreaking event in cinematic history as we’re inching closer towards eliminating the “uncanny valley” in constructing CG actors. I really haven’t seen another film that has done a better job visually, but the upcoming Valerian and the City of 1000 Planets may be its only real competition come Award Season. 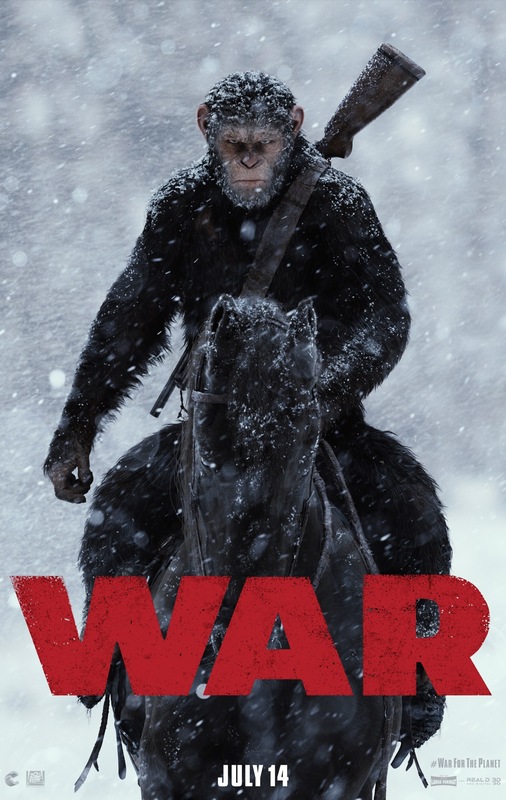 Many are wondering whether or not this film truly is a “war” for the apes and humans, and I have to say that it is, but not in the sense many may think. The film doesn’t necessarily have a ton of full-fledged battles that are reminiscent of a traditional war film (there are some really good battles in this film though, so don’t be too worried), but rather it focuses on the more personal effects of war and the more atrocious aspects of it. This film is probably the darkest of the trilogy, and I was surprised to find out that it was PG-13 and not rated R, as there is some really gruesome imagery. While I won’t really get into specifics, the film delves into the criminal element of war with settings much akin to Nazi-era Concentration Camps and North Korean hard-labor camps. The film really does a fantastic job at showing how humanity is lost in times of war and how it will probably be the true end to the species. Overall, this is a fantastic war film, not necessarily in the traditional sense. The film also does a pretty good job in leading into the events of the original Planet of the Apes film. We get some familiar settings, some explanations for why things may have transpired the way they have in the original film, and some familiar name-drops. I don’t want to get too spoilery in this review, but if you’re familiar with the original films, you’ll be able to spot these references pretty easily. They also follow some of the themes of the original with it being somewhat of an allegory for race relations and religion. This film has several instances of racial imagery ranging from allusions towards the infamous “the only good *insert racial slur here* is a dead one” and images of slave labor and punishment. I think that this was handled fairly well, as it furthers the thought of fear fueling hate between differing races (in the film’s case species) and conflicting ideologies. While I think that the film did a fairly good job in this, I think that their portrayal of religion was a bit too heavy. This part may get a bit spoilery if you don’t want to know anything about the film so I’ll put a spoiler warning here and a spoiler free zone marker when I’ve finished talking about the issue. SPOILERS HERE Caesar is portrayed as this Christ-like figure with him being whipped in front of a crowd of people and their ruler (Colonel McCullough), him being crucified, and him being struck to his side much like Jesus in his Crucifixion. There are also parallels to Moses as he leads his people away from the oppression of their adversaries to the Promised Land. SPOILER FREE ZONE I understand that Caesar would appear to be a Messianic figure to the Apes, but I just think that these multiple instances of showing Caesar to be Christ-like was a bit too much. 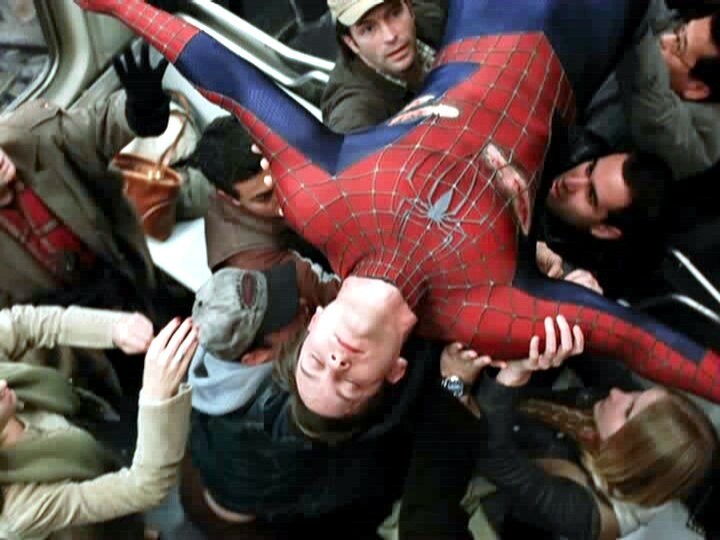 This really is just a pet-peeve of mine, as I see this in pretty much every superhero movie (Spider-Man, Superman, and Wonder Woman) but I’m not saying that this pet-peeve ruined the movie for me. There were also many other instances of religious imagery with the humans being represented with the AΩ symbol insinuating that they are the pinnacle of Divine Creation, and Colonel McCullough likening himself to God in the sacrifices he made for the good of humanity. I believe that the film could’ve done a better job in lacing in the religious imagery, but again it didn’t ruin the movie for me. Another gripe that I had was that things did seem a bit telegraphed with a couple of characters and their arcs. I won’t get too much into the specifics, but you can tell from pretty much the beginning of the film how some of the characters will progress or regress in the film and it was a bit disappointing, seeing that director Matt Reeves has done a magnificent job in building character in his apes and humans in both this film and his previous work Dawn of the Planet of the Apes. Even though it has some flaws, War for the Planet of the Apes is an incredible ending to this trilogy spearheaded by directors Rupert Wyatt and Matt Reeves. I believe that this trilogy will be remembered as a triumph in cinematic history and will be appreciated in future generations. Wow! This is truly a great review. I liked how you brought up historical war events to help the readers familiarize with the film better. And I agree that the visual effects department has done an outstanding job with this film. The apes truly look life-like. I have not seen the film yet but after reading this review I am curious to see it for myself. And to also see if I come up with the same thoughts.